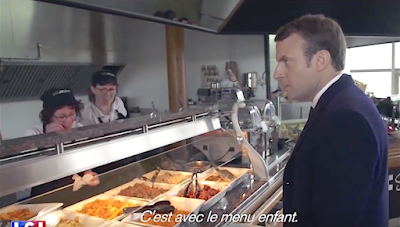 Macron: "Moi, j'aime bien les cordons bleus"
I think the documentary on Macron, "La Coulisse de la Victoire" has been instrumental in increasing Macron's popularity, and it seems like the favorite part of the documentary for the French is when Macron has stopped for lunch on the road at some kind of IKEA-style shop with a cafeteria, and he gets shot down when he asks for cordon bleu - he's told that its on the menu for children. You can see them making brief, goofy videos about the incident on Youtube here, and here and here. I mean, it's kinda cute, but he barely reacts at all to being denied cordon bleu and immediately says: OK, I'll have the salmon then. But for whatever reason, the French think this is amazing. Maybe because he seems like a typical Frenchman and not the banquier despised by the left nor the immigrant-lover despised by the right. Peut-etre. Europe 1 media wrote an article about the best bits in the documentary and this was the top of their list. My favorite parts are when he giggles over being hit with an egg, and when Macron returns after the first round debate and asks his team how he did and somebody says that Richard Ferrand fell asleep and Ferrand's all "no I didn't" and Sibeth Ndiaye who in my opinion is the star of the documentary second only to Macron himself goes "we all saw you dude." The dude who made the film talks about it here. One of these days I will be able to understand everything they say. On sait jamais! The Goguettes made a song about it. Which I still don't know French well enough to catch more than about 20% of the words. Merde! Arretez! C'est le French Language Police! Chapo Trap House: KNEEL BEFORE ZOD! This American Life: Who's Canadian?